So as some of you may have seen in my recent New Room Tour, I have slightly altered my makeup storage since moving house. 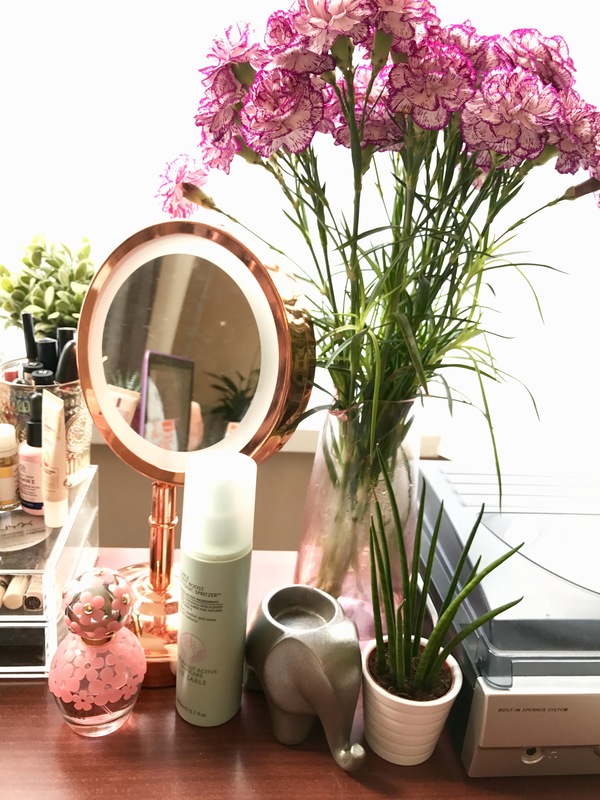 Not only that but I have seriously streamlined my collection to contain only products that I absolutely love, so today I thought I would talk you through my makeup collection. If I had told my past self that all my makeup would fit in and around 1 set of drawers and a basket in 2017 I would have laughed. I have had a passion for makeup since leaving school, I loved reading about it, wearing it, playing about with it to create new looks, I just loved it. I also loved buying it. I would say I had a pretty decent sized collection of makeup, even up to as late as last year. Don’t get me wrong I was using the stuff, but it got to a point where I realised I didn’t need any more, I wasn’t getting enough use out of what I had and to be honest it’s an expensive habit to keep up. 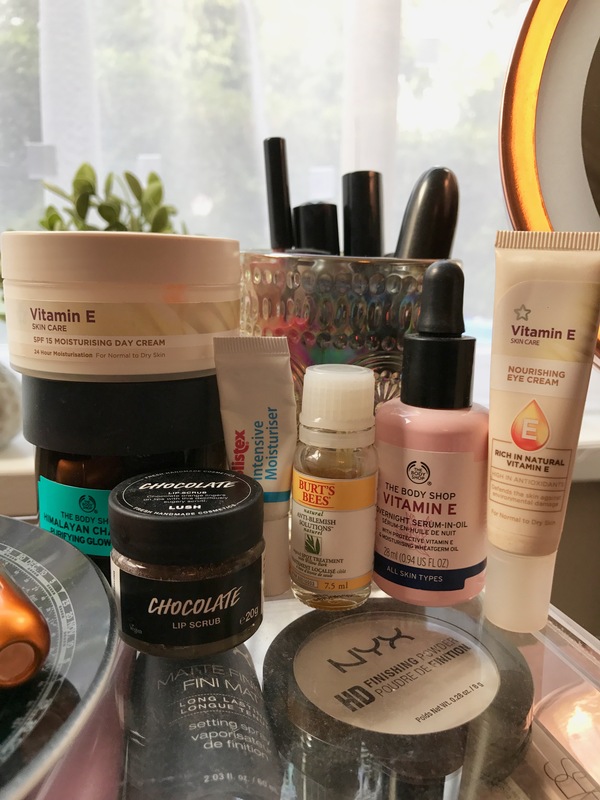 What’s more at the start of this year, I made the decision to go cruelty-free with my makeup and skincare so that therefore put a blanket ban on buying A LOT of brands. After having a good old clear out of things that were out of date, I didn’t use or were broken, I was left with a much more manageable and USEABLE amount. 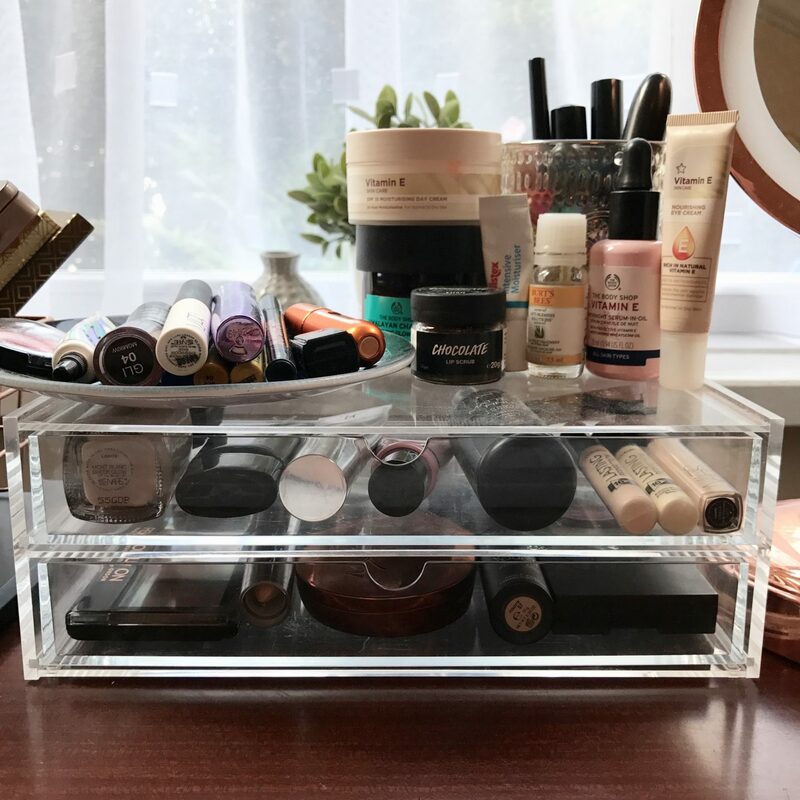 So, I keep all my makeup on my desk because it’s massive, the bulk of my base and powder products are stored in my MUJI 2 drawer container. 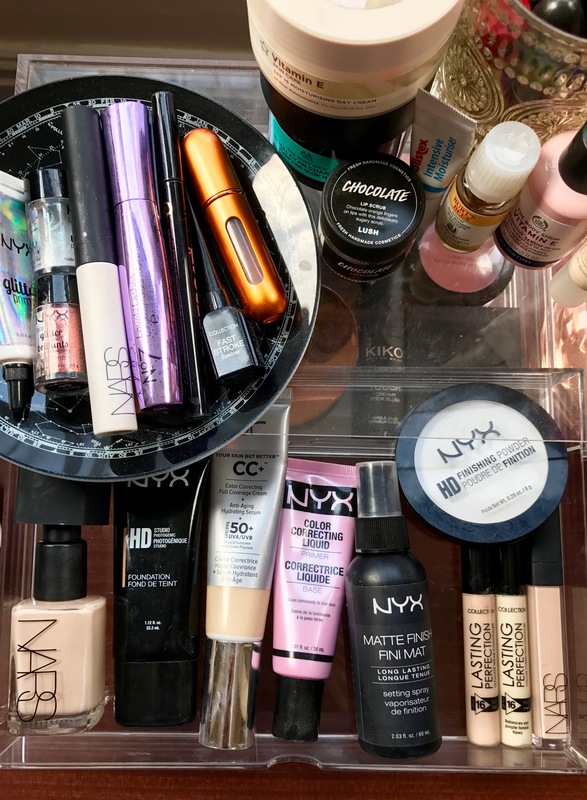 The top drawer contains my base, foundations, primer, setting spray, concealers and powder. As it stands I only keep 2 or 3 of each type of products on the go now (apart from palettes), so for example I have 3 foundations, which includes a Summer and Winter shade, but I only have 1 primer, which I will just replace as it nears being empty. I find that this way I don’t end up with a backlog of products that will go out of date. The lower drawer contains my cheek products and a stray eyebrow kit by Sleek. Again, it’s quite a small number of products, 3 blush, 2 highlighters, 2 contour and 1 bronzer. For someone that works in an environment surrounded by makeup I feel like this is pretty restrained. I’m also aware that to some people having 3 blushes may be excessive, whereas other people may own 30, there’s no right amount for everyone. I like the drawers as I can see where everything is and it’s quite aesthetically pleasing to me haha. The only downside is I’m constantly wiping them because they show the dirt. 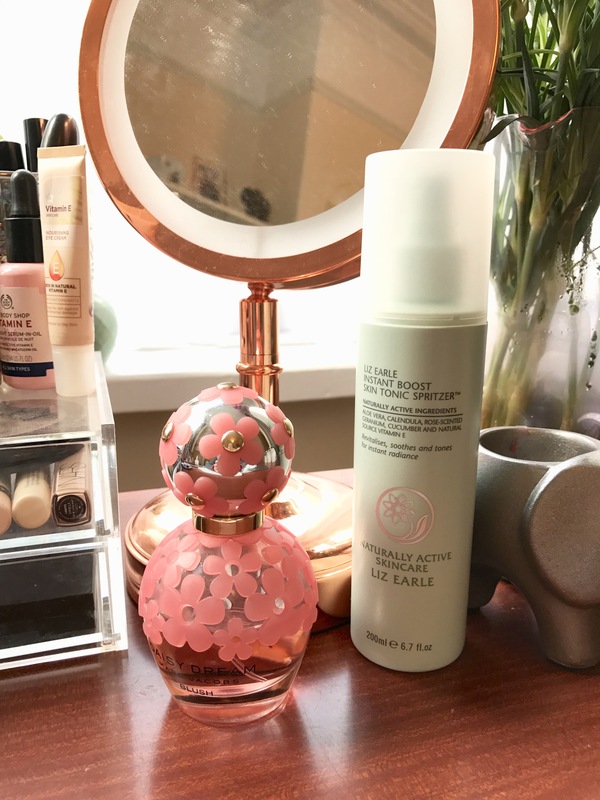 To the right side of this container is my No7 Light Up mirror, I also keep my Perfume that I am currently using and my Liz Earle Instant Boost Skin Tonic Spritzer to remind me to finish it up. I also have a small vase with some flowers to brighten up the room. Further over to the right are my makeup brushes, stored in Ikea Plant Pots and segregated by type; Eye, Base and Finish. 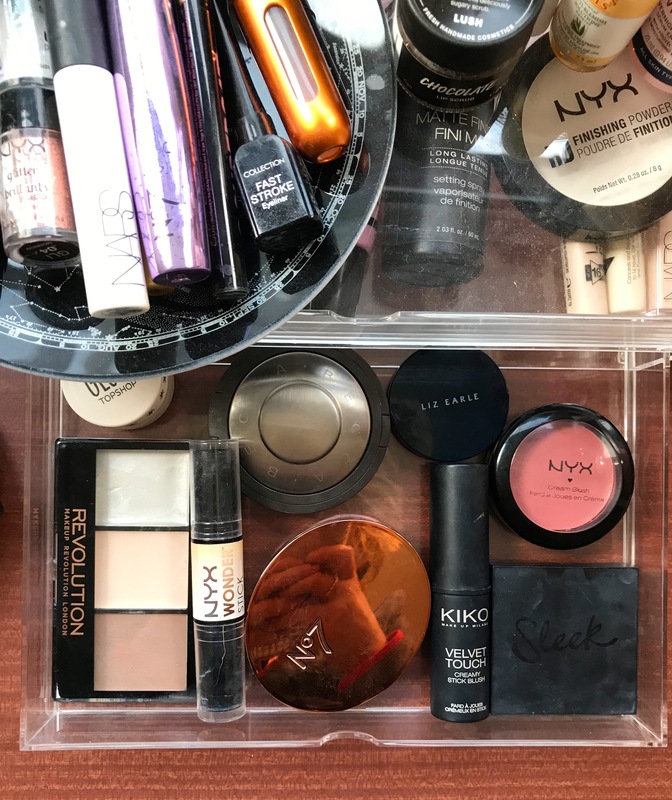 Moving back over to the drawers, I store the rest of my makeup and everyday skincare on top. 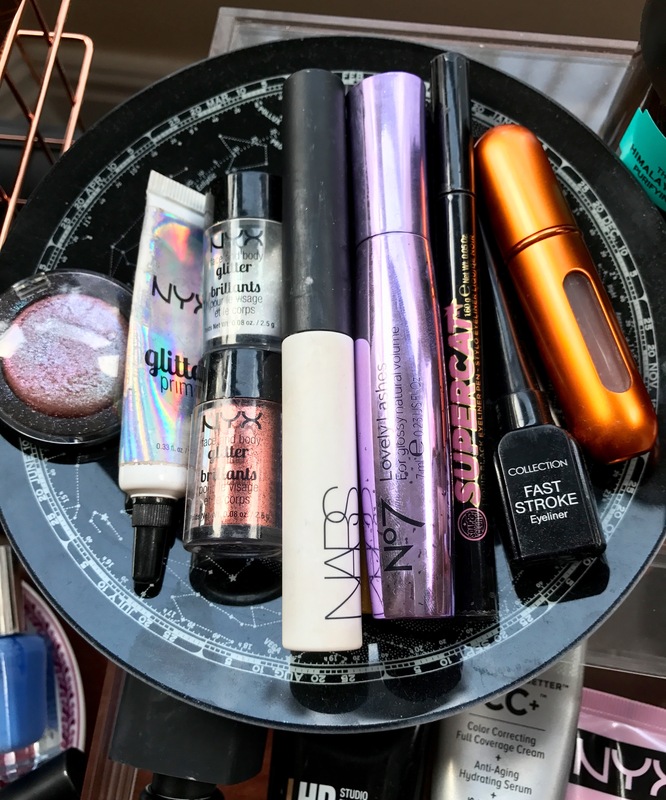 I have a dish which holds all my eyeliners, mascara, glitter and eye primer as well as a Perfume atomizer for travel. I only have one Mascara and Eye Primer on the go at once so they don’t expire. 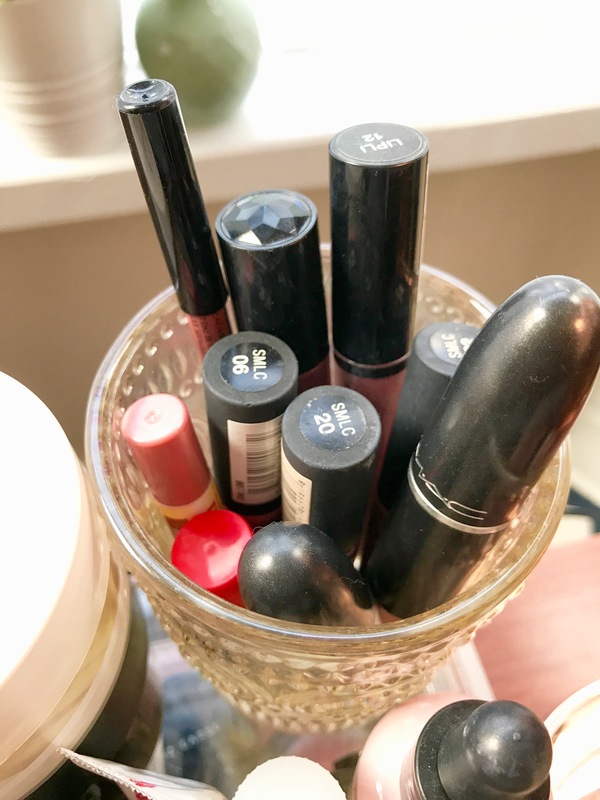 Next to this are my lipsticks which new fit into a small container. I now only own around 10 lipsticks which I don’t think is that bad at all. Also on top of the storage are my moisturiser and eye cream, Vitamin E Oil, Clay Facemask, a Lush Lip Scrub, Burt’s Bees Spot Treatment and a Lip balm. This might sound crowded but these are all products I use daily or multiple times a week. 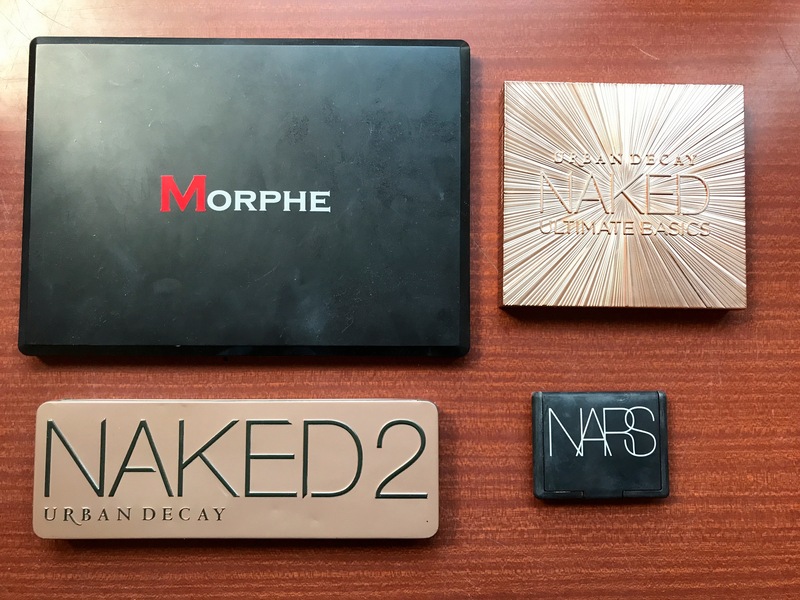 Urban Decay Naked, Urban Decay Naked 2, Urban Decay Naked Ultimate Basics, Morphe 35F, NYX Ultimate Brights, Zoeva Plaisir Box containing Cocoa Blend, Caramel Melange and Blanc Fusion. 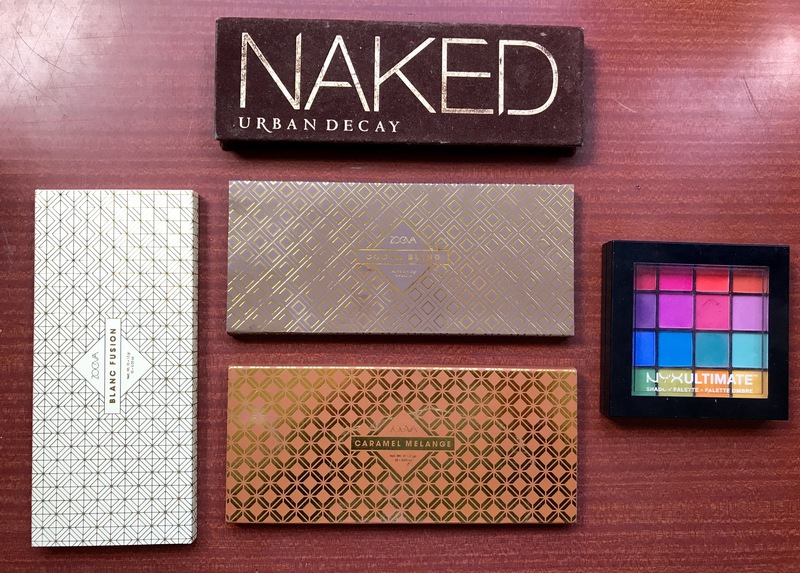 Palettes are my weakness I just can’t get rid of them as a use them all….and to be fair 3 came altogether in one set. I know I have quite a few but because of this I know not to buy anymore for a long time no matter how tempted I am. So that is all my makeup, oh and one final thing is my very small nail varnish collection. 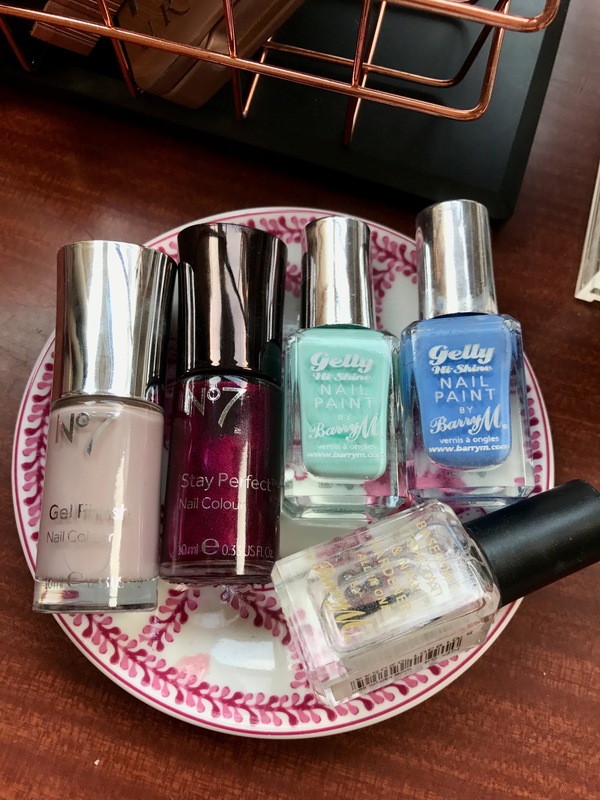 I hardly ever paint my nails, only my toes so I don’t need many colours, these are all Barry M or No7 and they are again stored on a plate as there are so few. So there you have it, that’s everything, not too much that it will never get used, but enough so that I have choice and don’t feel bored or uninspired. Let me know if we share any favourite products or storage systems! Also one last point, which I have made before but will make again. I am trying very hard to transition to cruelty free so am only now buying CF brands but there are still some non cruelty-free products lingering around waiting to be used up. Also some brands *cough* Nars *cough* have recently made changes away from being cruelty-free so I am constantly on the hunt for recommendations and replacements so do let me knew in the comments if you have any!! My storage organizer is white and plastic as well, so I can totally relate. For cruelty free brands, Ipsy subscription boxes helped a lot with that. I use Trust Fund Beauty and Pretty Woman NYC Nail polish. I use a lot of NYX, Colour pop and essence lipstick as well. I use coastal scents eyeshadows. which are cheap, pretty pigmented and cruelty free :). I love the cute dish you use for your nail polishes. ohhh gotcha lol, that’s where I get a lot of my stuff from too and anytime :). 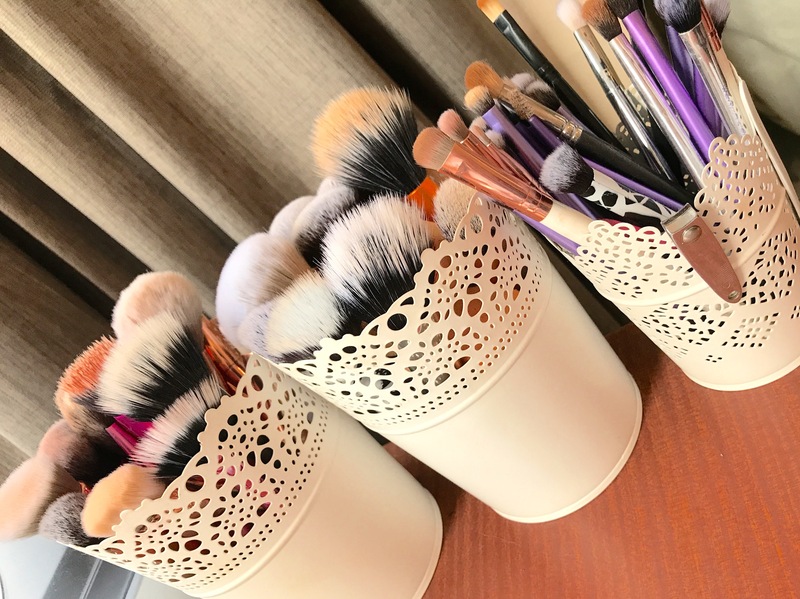 LOVE the cute idea you have for your brushes. 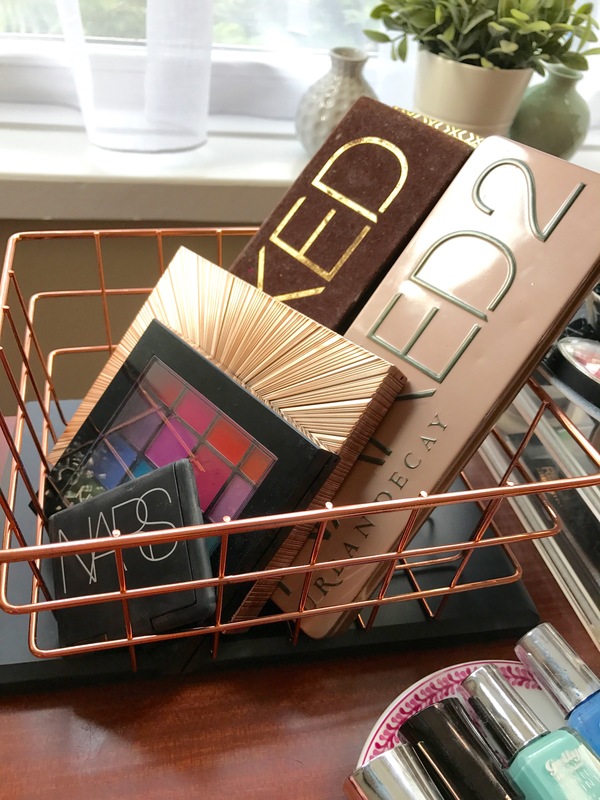 I’ve been looking to revamp the way I store my makeup and this post had some great ideas!